When K5600, Inc. introduced this unique wattage to the market in 1999, we expected it to be a welcomed change…But never did we expect it to become our # 1 seller and discontinue our own 1200! A JOKER-BUG 800 owner obviously understands the enormous advantages of this unique fixture. 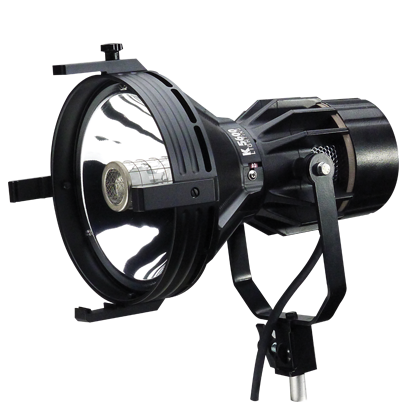 Less is More - JOKER-BUG 800 puts out 50% more light than a 1200 in a Chimera®. Less is More - JOKER-BUG 800 is smaller than its nearest lower wattage (575). And fits in the same case as a JOKER 400! Less is More - JOKER-BUG 800 only draws 11 Amps allowing for a 400W to be used on the same circuit! Lamp Housing Aluminum casting, high temperature black. Striker compartment is made of aluminum in light gray finish. Lamp Socket G22, highly insulated for hot restrike. Safety Glass Beaker Borosilicate tempered. Yoke Aluminum casting black high temperature finish. Large T-handle and large brake area for use with Lightbanks, Speed Rings, Louvers and Lanterns. BEAMER Housing Solid one piece machined aluminum with replaceable ears. Black anodized. BEAMER Reflector 7" diameter specular parabolic, aluminum 90 percent reflectance electrolytically coated. Mounting/Grip Equipment All standard 5/8" baby hardware. 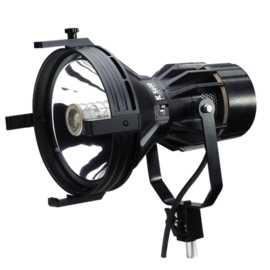 Lamp 800 Watt MSR/SE daylight single ended discharge. Special UV-Stop envelope. 600 hours maximum life. Connectors Veam quarter-turn quick locking. Extension Cable 25 foot shielded. Common to 200/400 and 800 (nine feet attached to the head). Power Supply Electronic, square wave flicker free. AC input 90V to 132V or by sliding selector switch: 180-265V, 50 or 60Hz. On/Off push button switch. Completely silent (convection cooled).